I remember enjoying the film, but I had no idea it was a novel first. The quotes you pulled out were really interesting. Thankfully its long enough ago that I can read the novel now without scenes from the film in my head! That’s exactly the reason why I left such a gap between watching the film and reading the novel! I wanted to leave enough time for those images to fade away from my mind. I’m glad you like the quotes – they really stood out for me. God, can you imagine a worse job than being a clerk in the Argentinian investigative court during those years? I’m sold! I know! It must have been one dirty deed after another. I think you’d enjoy this novel very much, Marina. The characterisation is great, and the plot has enough layers to keep your interest. It’s right up your alley, so to speak. I find this period of ‘history’ ( makes me feel old) fascinating that together with the legal connection means this will be going on my wish list . That’s excellent – definitely one for you, Helen! I think you’d enjoy Chaparro’s reflections on the judicial system. I found the context/setting fascinating. Have to say you’ve hooked me completely with this one Jacqui… both the key characters & the relationship between Chaparro & Morales sound intriguing and what about Liliana? I’m wondering if we get to know more of her, when her demise strikes such a reaction ‘he’d realized that yes, beyond the shadow of a doubt, his future was nothing’… on the 2016 wishlist! Hurrah! The characterisation is excellent here, especially the portrayal of the two central characters – Chaparro just cannot seem to shake the image of Morales from his mind. It’s difficult to say anything else about the plot for fear of revealing any major spoilers…but if you read the novel, I think you’ll understand why Morales is so utterly devastated by Liliana’s death. It’s one of the reasons why the characterisation feels so convincing. Superb review! I haven’t seen the movies or read the books, but you’ve made me want to now. Where do you suggest I start? (Already own the DVD). Thank you, Elena! Well, if you’re keen to experience both within a reasonably short space of time I would suggest starting with the novel (otherwise your mind will be full of images and impressions of the characters from the film). In many ways, I wish I’d read the novel before seeing the screen adaptation. That’s one of the reasons why I’ve left such a gap between the two – it’s been a good three or four years since I last watched the film, so those images have faded over time. I hope you enjoy! I’m reading the novel first, then! Great – I hope you like it! As you describe it there are lots of threads that have a lot of potential to drive a good story and generate interesting characters. Though I have not read a lot of fiction involving crime, I think that it is a bit unusual for a book to center around the relationship between a decretive and a murder victim’s husband. Yes, there’s a lot going on here, and Sacheri could have pushed the narrative in any number of different directions. That’s a good point about the unusual nature of the relationship…and there’s no sexual attraction between these two (or at least I didn’t detect any). I’m trying to think of another novel where a man involved in the investigation of a crime forms such a strong bond with the victim’s husband. Nothing springs to mind. Even though Chaparro doesn’t work in the police force (he’s a clerk in the investigative branch of the court), the fact that he can’t forget about Morales prompts him to do a little detective work of his own. So he ends up playing the role of detective so to speak! Just watched the movie trailer, which looks excellent. But, the book sounds even better (no surprise there)! I’ve never heard of this one before, so thanks for the review! You’re very welcome. Both are great, but I think I prefer the book over the original Argentine version of the film. Oddly enough, I just discovered that the movie has been remade with Chiwetel Ejiofor and Alfred Molina in the key roles – it came out in the US and Canada last week! Just to complicate things further, the plot summary looks a little different to the original Argentine adaptation, so it’ll be interesting to see how it goes down. I loved the movie, but at the time I saw it the novel hadn’t been translated, and somehow I’ve managed to miss that it has since been so. Many thanks for the heads-up and for such a glowing essay about it. *sigh* Off to the library we go . . . I loved the original movie, too, but I reckon the novel is even better! You’re in for a treat as long as you’re fine with the slow-burn style – it’s not the paciest of stories, but I found it thoroughly absorbing from start to finish. I heard about the remake the other day, and my immediate instinct was to run away as fast as I could. However, Pam had read a review which said that Julia Roberts’s performance in it is perhaps her best ever, so I may deign hoity-toitily to watch the thing if it comes on t’telly. Even so, if ever a movie didn’t need to be remade, this is it. The sole reason for the remake, so far as Pam and I could work out, is the reluctance of the US public to watch movies with subtitles. Oh, gibber. The gods themselves contend in vain, etc. Haha! Yes, that was my initial reaction, too. Encouraging reports about Julia Roberts, though (and I do like Chiwetel Ejiofor – he’s a terrific actor). Maybe I’ll go along to see it when it opens over here. The reluctance of the wider public to watch films with subtitles must be behind a lot of these remakes. Tomas Alfredson’s Let the Right One In was another excellent foreign language film that didn’t need to be messed with. A different type of movie, but that’s one of my favourite films in recent years. Tomas Alfredson’s Let the Right One In was another excellent foreign language film that didn’t need to be messed with. Agreed. It was great the way it was. Again, I didn’t see the remake. I have seen the remake. It’s okay, but the portrayal of the central relationship in the original film was so touching – it’s very hard to top something as good as that! Glad to hear we’re on the same page! Oh, and slow burn doesn’t trouble me. I’d heard of this film but had no idea it was based on a novel (and one which had been translated) – it sounds great. In a bizarrely related question about Jenny Erpenbeck’s novels, try The Book of Words which is (possibly) set in Argentina during the ‘dirty war’. It’s excellent, Grant…and I would definitely recommend the original Argentine version of the film, too – I think you’d enjoy it very much. Thanks for getting back to me with a recommendation for where to go next with Erpenbeck. It sounds excellent (and possibly better suited to me than Visitation!) – on the list it goes. You just reminded me how long it’s been since I’ve read any South American literature. I like the sound of it, and I can only echo MarinaSofia’s comment: to work for the judicial system at that time…. I will have to ask if my mom knows or has this book. Sounds like something we might enjoy reading together. Oh, that sounds great. It’s been a while since I read anything from South America, too – all my Spanish Lit Month reads earlier this year came from Spain. I found the ins and outs of the judicial system (plus the political backdrop) absolutely fascinating. It’s also very readable and highly engaging. The author provides just the right amount of insight, so you never feel as though you’re getting bogged down in an unnecessary level of detail (or at least I didn’t). Was just thinking as I read this, and linked to the reference to the “Literature of Doom” that there is a horribly serendipitous feel , with the events in Paris so recent. Living in Washington, DC, I remember watching the bombs fall in New York on 9-11, and, when hearing of the Pentagon bomb, instinctively looking up towards the ceiling with all of the my coworkers. We worked about a 5 minute walk from the White House. Now, with our friends in ISIS sending us glad tidings and naming our city, we have once again gotten used to walking by armed soldiers and dogs in the Metro, airports and train stations. Chief Lanier of our police force has urged us to use the 3-prong tactic of Avoid – Hide – FIGHT!, and we are all being urged to go to Step #3, if needed, to fight back against “active attackers” in the allotment of time (10, 20 30 minutes) it will take to have the police show up. There are even videos showing people throwing fire extinguishers, purses, and canes at intruders to stop them. In terms of the idea of “doom,” I wonder if there is a distinction between being under attack in a free and open city such as Paris, and being under occupation by one’s own government, as one would have been as a citizen in Argentina during the Dirty War. I was so chuffed to see the crowds out in Paris last Friday nights in the cafes in a sign of defiance. Perhaps less soul-sapping than living under state-sponsored oppression? Lots to ponder, but I hope everyone keeps filling the cafes, but is ready to fight if needed. Hi Maureen, thanks for your comments. It must have been very frightening for you around the time of 9/11 – I can’t begin to imagine what it must have felt like, especially as you were so close to the White House. As you say, lots to ponder here. The novel does a good job in capturing the mood in Argentina at the time – not that I was there of course, but that’s my impression. Each of the situations you describe towards the end of your comments presents its own challenges. At the end of the day, though, better to live in an open city than one ruled by an oppressive regime. Thanks again for your comments – wishing you a safe and peaceful time in the weeks and months ahead. Wow – great review of what sounds like a great novel. Onto the wish list it goes!!! Thank you – I was very impressed by this one! I hope you enjoy it should you get the chance to read it. I saw the novel at my local bookstore a while ago and debated whether or not I should purchase it. Like you, it has been a while since I saw the film so I could read the novel smoothly without having the film scenes interrupt. But at the same I wondered what was the point of experiencing the same story twice. It’s interesting that the novel focuses more on Chaparro and Morales’ unlikely relationship, rather than Chaparro’s love for Irene (which is how it was in the film, if I recall correctly). I’m not completely sold that I should get the novel but it’s on the “someday, perhaps” wishlist. Thanks for the thoughtful review! You’re very welcome! I know what you mean about the value (or lack of it) of experiencing the same story all over again, but in this case I think the novel has something different to offer. Your recall of the film is correct – it dials up Chaparro’s relationship with Irene, so the romance element plays a greater role in the original screen adaptation than in the novel. The book offers more space for character development, so I came away from it with a much better appreciation of Chaparro and Morales (and the nature of the connection they form over time). It’s an interesting comparison! i was so taken by this book after reading your review that I immediately started looking to buy a copy. Even in the second hand options this would be rather expensive for a paper back so i think I’ll have to wait a while….. I was just reminded of this beautiful film with its gorgeous soundtrack yesterday when Arti at Ripple Effects wrote about the new Hollywood version of the film that is coming out, mentioning the original film and the novel. It had me finding the music on Youtube and listening again, it is such a beautiful soundtrack and the best kind of accompanying music for writing a review! The actor was brilliant, such muted charisma. The book sounds good too, more than just a mystery, was it translated because of the film or was it considered to have been of sufficient literary merit to crossover into English? What a coincidence! Oddly enough, I only heard about the American remake on Tuesday when it came up in the Google search for links to the film. Thanks for letting me know about Arti’s post – I’ll be heading over to read it later this morning. (I’m usually not a fan of these Hollywood remakes of foreign language films, but the new version features Chiwetel Ejiofor, so I’m trying to keep an open mind!) Yes, great music in the original film – I’ve very keen to watch it again very soon. As for the book, the English translation (published in 2011) came after the release of the original film, so I guess that provided the impetus – I’m sure the film must have increased the appetite for a translation. That said, I think the novel is more than strong enough to stand on its own merits. There’s so much more to it than just the mystery of Liliana’s death – the characterisation, in particular, is excellent. Thanks, Arti. I wanted to hold off from revealing anything that could be construed as a spoiler as the plot is quite intricate and best kept under wraps. And yes, I did notice the difference between the two endings! Even though it’s been quite a while since I last watched the Ricardo Darin version, those closing frames have stayed with me. Thanks for letting me know about your post – I’ll be heading over to yours very shortly. (Funnily enough, Claire also mentioned it in her comments above.) I haven’t seen the American remake as it’s not out over here till March, but I’m very interested to see what you think of it. There’s some good, interesting differences between the film and the book aren’t there? Did you hear about the American remake? Don’t think I’ll be watching that. 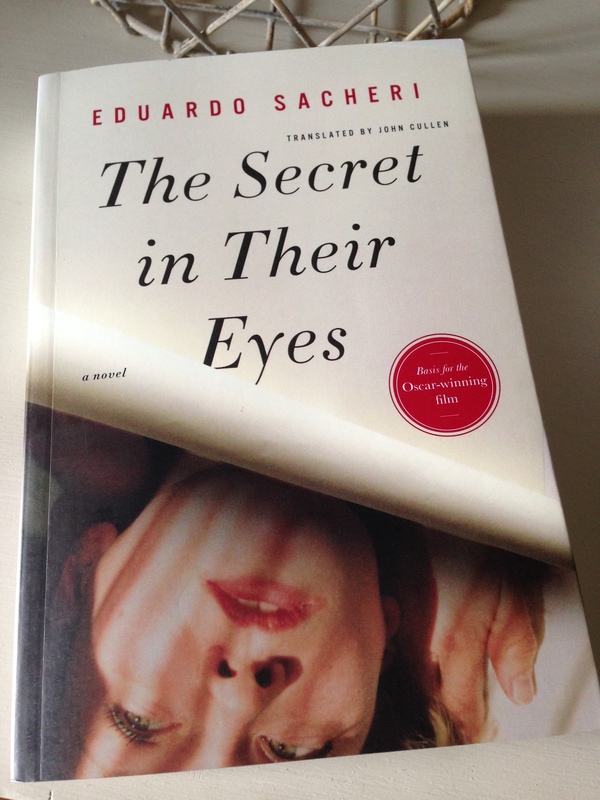 I read another novel by this author, btw, which I didn’t like nearly as much…. Yes, definitely – I’m very keen to revisit the original film fairly soon just to look at those differences in a little more detail. Like you, I think I prefer the way the novel deals with the balance between all the different strands of the story. The original film is still excellent, though – Ricardo Darin is just perfect as Chaparro. Oddly enough, I only found out about the Amercian remake on Tuesday morning when I searched for an IMDB link to the film to include at the beginning of my post. These remakes of foreign language films are rarely as good as the original versions and in this instance Campanella’s film is going to be very hard to beat. I don’t know if you noticed it in the comment above, but Arti (of the Ripple Effects blog) has just posted a review of the American remake (along with notes on the original film and Sacheri’s novel). It doesn’t sound too great – if you’re interested, there’s a link in the previous comment. Oh, I think I recall you reviewing that other one by Sacheri – Papers in the Wind? Shame you didn’t enjoy it as much as Secrets – I’ll nip back for another read of your post just to remind myself. I don’t know the novel or the film(s), but this sounds very good, a perfect fit for the Argentine Literature of Doom. Yes, it was a great choice for Richard’s event! Even if you never read the novel, you must take a look at the original film – I think you’d like it very much. Many thanks for hosting the Argentine (and Algerian) lit event. Richard. I’m looking forward to seeing what turns up in December. Nice review as ever, and it sounds like a good book. Argentina really does have an interesting literary culture doesn’t it? I must (re)read Guy’s review, though I note he didn’t like the other as much. Will you try that one do you think? Thanks, Max. I do think you would like this one. Yes, Argentina does have a fascinating literary culture – the likes of Borges, Ocampo and Bioy Casares must have started something there. I have a Claudia Pineiro in my TBR as well – it’s the one you reviewed last year, Thursday Night Widows. I’m looking forward to it. After rereading Guy’s review of the other Sacheri (Papers in the Wind), I’m going to pass. It sounds quite different to Secret, so I’m hoping we might see another crime novel from him at some point in the future.